Ok, now that you have come back it's time to show off some cards. I picked up a hobby box of Topps Magic. By the end of the box, I regretted it. I now have (2) Andre Roberts autographs.... joy... if I had remembered that Wes was a Cardinals fan, I would have ninja-star tossed this card across the tables to him, maybe it'll be in my next package headed his way. 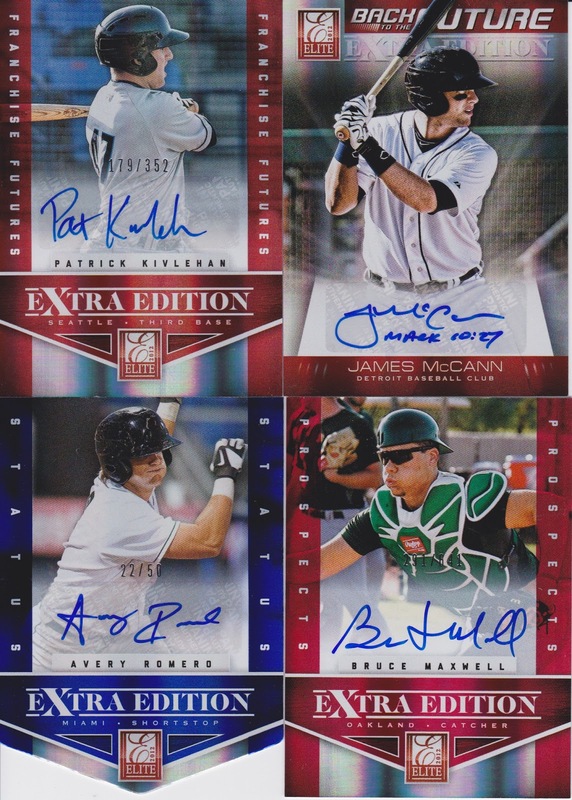 Another tale of regret, I bought a few packs of Donruss Elite Edition. Alright, next is a random package from Jeff over at 2x3 Heroes. I'm not sure what he was thinking other than to add some padding to the package for the Gold Bougesevic. Auto of Peter Tom Willis, why? Why Jeff?!?!!?! I got another of these gold Bogusevics at trade night. So I now own at least 2 of the 2013 out there... thanks Jeff! Cosart! 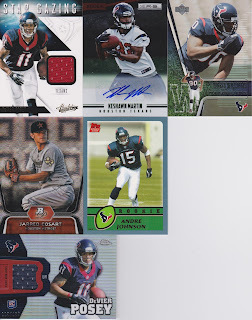 Awesome... a couple relics of DeVier Posey, can't complain as long as he recovers from the Achillies tendon rupture. Keshawn Martin auto /99: SWEET! But what I'm most excited about is the Andre Johnson RC! I've wanted one for a while and Jeff was more than willing to part with it! Thanks Jeff #2 of this post! Alright! Thanks for stopping by everyone! The group break cards, hopefully, will be here by the end of the week. If not, it'll probably be next Friday before I can get to the apartment office to pick up my packages! So, we'll see how it goes. I tried to time the order so that they'd get here this Friday. Oh well. 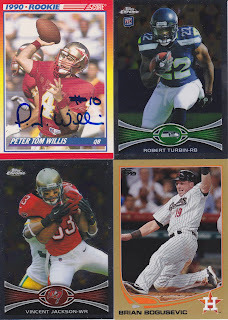 I got that Willis card (and the other two chromes) in some pack from my LCS. I had to dump it on someone. And yeah - padding for the gold. a jedi! dump? I used to covet that PTW card quite a bit back then... It was one of the first of the "new" football cards I could not stop staring at. My proportion obsession begun? I want it dumped on me. (there has got to be a better way to say that). email of trade fodder on its way.